3D printing may be all the rage in the startup world now, but how many of us actually know that it was a Dutchman who actually created the world’s first 3D-printed house? In fact, The Netherlands would really like you to know that while it may be a really small country in northern Europe, that they are actually quite an innovative people. So much so that the Royal Netherlands Embassy has developed DailyDutchInnovation.com, a website wholly dedicated to celebrating Dutch startup and innovation culture. Each and every day, the site will highlight a different innovation from a variety of industries and sciences, covering both current as well as historical examples. We’d get to read how the stock exchange, Bluetooth, the metronome, Python (a programming language), and indoor clouds all are rooted in Dutch innovation. 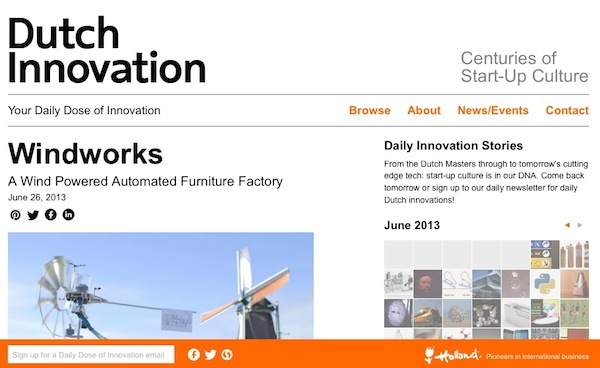 As a national initiative, we think DailyDutchInnovation.com is pretty ingenious itself.